The Intermediate Canoe Award is a 5-day course delivered in a moving (Grade 2) and open water environment with winds up to force 3. 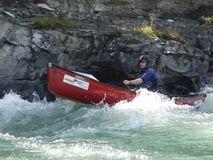 The course content includes clothing and equipment, access and conservation, river hazards and grading, weather, lifting, carrying and launching, efficient forward/reverse paddling, moving sideways, edging, support strokes, breaking in/out, ferry gliding, group/self/deep water rescues, boat trim, sailing and poling. The outcome of this course is for the candidate to demonstrate personal competence in paddling open water in wind conditions of Beaufort Force 3 and on grade 1 moving water as part of a led group. The British Canoeing Canoe Award is incorporated into this course.